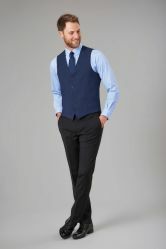 The Busso waistcoat is cloth backed, and matches both the Imola and the Avalino suits from Brook Taverner. Europe’s finest washable clothing! Tailored from the finest wool with Lycra fabric available from any clothing supplier. Single Breasted fully lined Jacket. For the best results, the wash bag should always be used when washing these garments. Swift Delivery/returns and the support staff are excellent. Will use them in the future! Almost an exact match for the jacket.